It's been a busy first couple of months of 2015 for our Paul. He performed an intimate show at Irving Plaza in New York City on Valentines Day for just under a 1000 lucky people, He performed 'I've Just Seen A Face' with Paul Simon and 'Maybe I'm Amazed' on the Saturday Night Live special commemorating it's 40th anniversary, and what else? Oh yeah, he collaborated with Kanye West & Rhianna. Much has been said about the collaboration between Paul, Rhianna & Kanye as well as Paul's collaboration with Kanye on his song 'Only One'. Musically, 'Only One' has Kanye singing while Paul plays some chords on an electric piano. Kanye's voice is going through auto-tune, which many see as an indication that he can't sing at all. Furthermore, Kanye's commentary on his own artistic merit and his actions, particularly at the Grammys, has led many to dismiss him entirely. 'Four Five Seconds' features Kanye and Rhianna sharing vocal duties while Paul strums chords on an acoustic guitar. I don't listen to Kanye West's music and the only Rhianna song I know is "Umbrella...ella...ella...ella...eyyyy!" and I find myself singing 'Four Five Seconds' chorus quite a lot now. Is that the Paul McCartney effect? Perhaps so. Say what you want about Kanye West, the fact remains that he wanted to work with Paul McCartney. Which shows that he acknowledges and respects Paul and his work which deserves a nod of appreciation, however grudgingly. Macca, Rhianna & Kanye performed the song 'Four Five Seconds' at the 2015 Grammy Awards. There was a bit I liked when Kanye acknowledged Paul halfway through the song. All in all it was a solid performance and it wasn't as bad as many people wanted it to be. Twitter blew up with all kinds of trolls who were there to rile up the Beatles fans with tweets such as "Who is this Paul McCartney guy? He's going to be so big now because of Kanye!" all of which were extremely tongue in cheek. 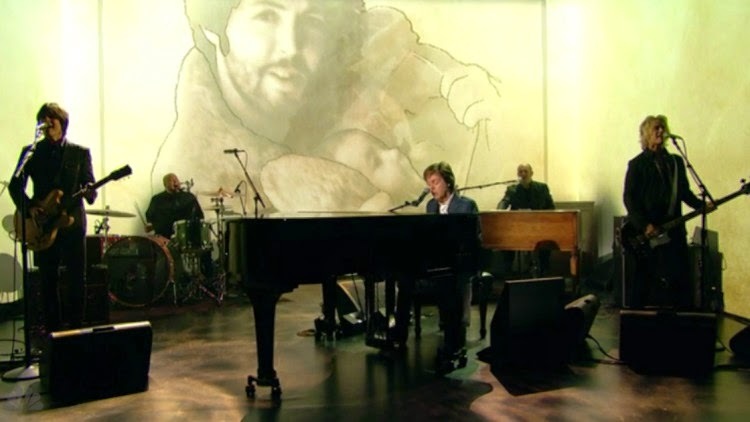 The Two Paul's perform the Beatles' classic 'I've Just Seen A Face' on SNL40. Paul's appearance on SNL's 40th Anniversary show was also great. Paul at first performed an impromptu version of the Beatles' 1965 song 'I've Just Seen A Face' with Paul Simon as a joke audition, after failing, Paul Simon said to McCartney: "I told you we should have done 'Sound of Silence'!" referring to the Simon & Garfunkel hit from 1967. Later in the show, Paul and his band performed 'Maybe I'm Amazed'. Perhaps not the best song to sing after a gig the night before but Paul, as usual, proved he didn't need any help and hit notes that many in their prime couldn't hit. Paul performs 'Maybe I'm Amazed', his debut solo single from 1970, on SNL40. The after party proved to be another rocking affair with Paul jamming on a borrowed left handed bass and rocking out with Taylor Swift, who was undoubtedly delighted. 2015 is going to be an interesting year for Paul McCartney, he already has his 'Out There' tour plans for Asia and perhaps this year will be the year that Paul takes his show down under to Australia? Fingers crossed for all your Aussie fans!